Just as Mama Bear emerges from her long winter's rest to enjoy her first cup of morning coffee, I have emerged from my cozy habitat here at The Crane's Nest to embrace the coming of spring. 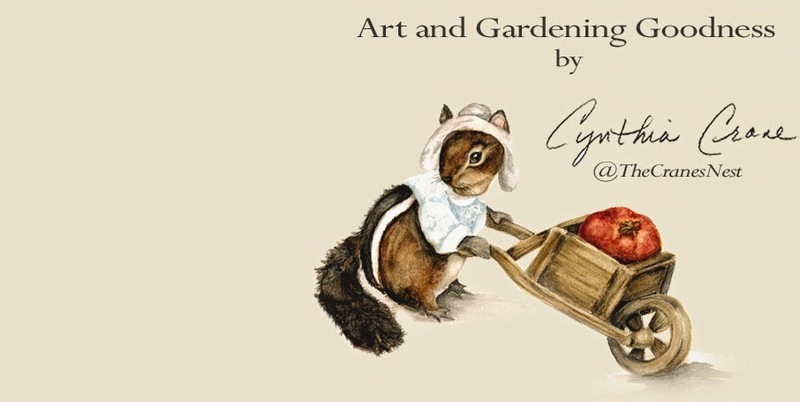 In case you're wondering where I've been, well I gave myself the gift of a long winter vacation from painting, potterying and blogging and immersed myself in 3 months of homespun goodness. There were many, many fun little projects that had been on my to-do list for a very long time and this was my opportunity to see some of them to completion. Over the next few blog posts I'll be sharing those with you. 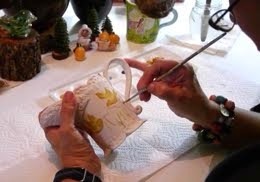 So pour yourself a cuppa your favorite beverage and cozy up in your chair while I share a few of those fun winter projects! 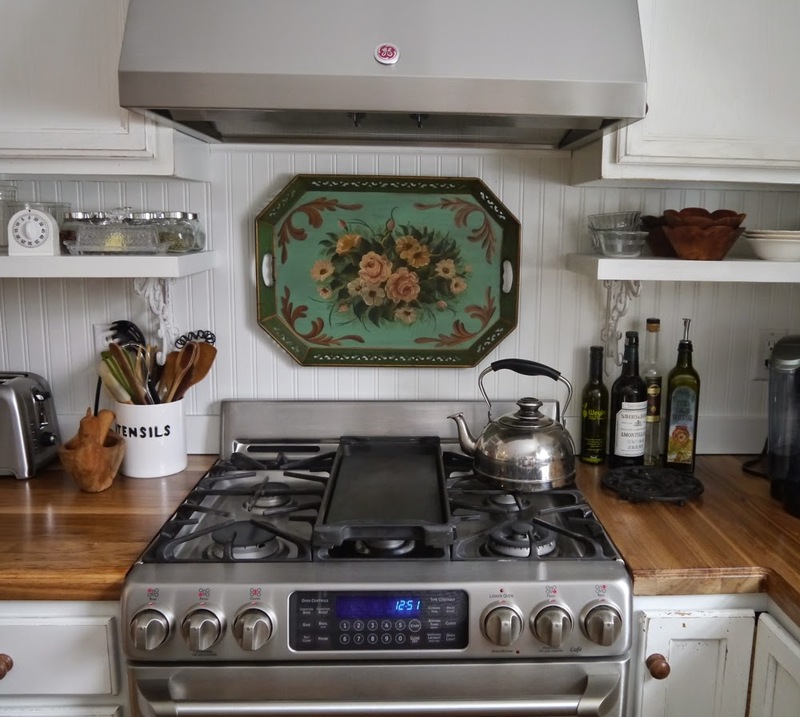 As many of you know, we finished a large kitchen renovation last year, and today I want to share a couple of small decorating details I added there this winter. FIRST UP - VINTAGE TOLE TRAY and PAINTED FRENCH GARDEN JUG. Something new for the wall above my range. 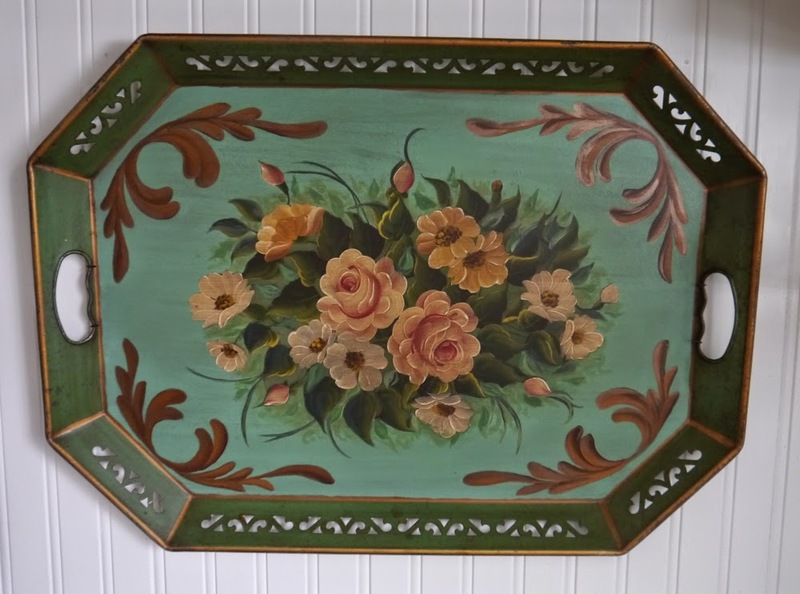 I'll start our little tour with this lovely green tole tray purchased from Etsy shop VintageKeepsake. This tray was just the thing I'd been wanting to hang above my range. Close up of new green painted background. 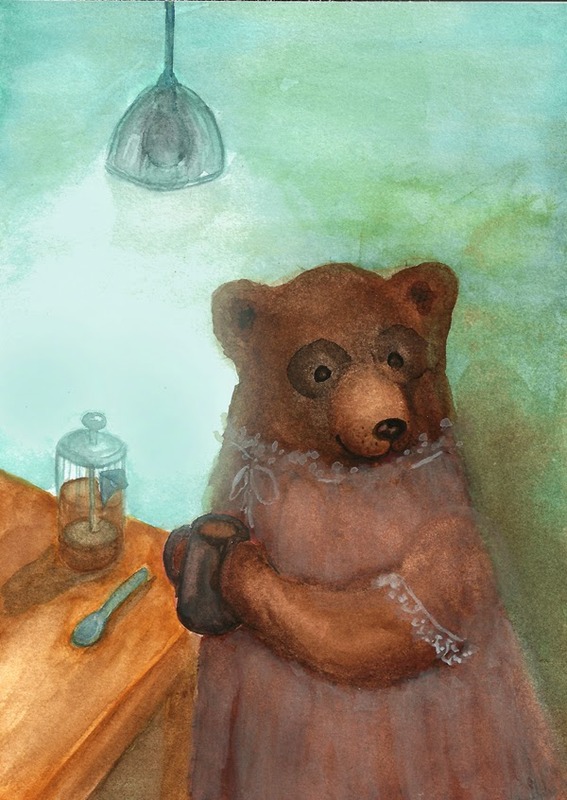 But it wasn't quite the "right" shade of green so I re-painted the background (eeek! gasp! you didn't, says the "vintage purist"!) This wasn't easy to do, but using my somewhat limited decorative painting skills I was able to add a little more detail to the flowers and leaves motif to integrate the newly painted area. 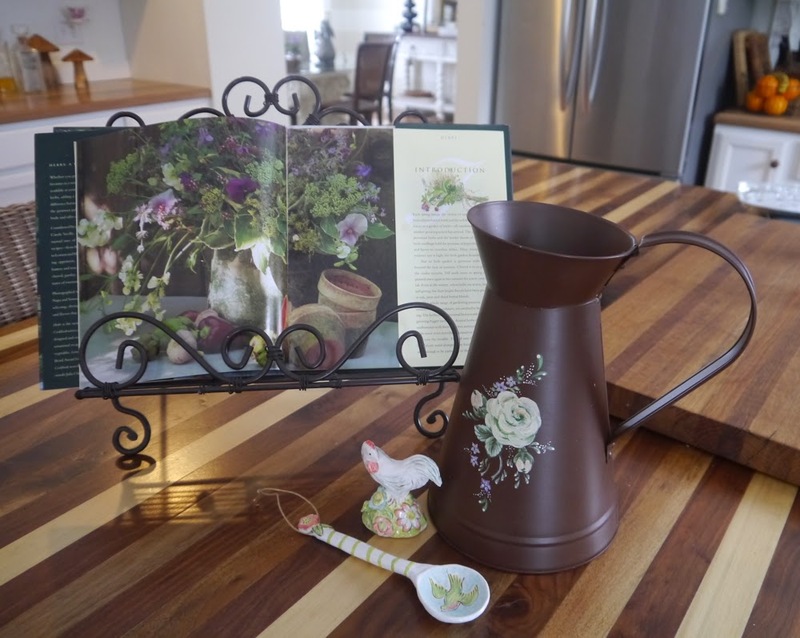 Speaking of my limited decorative painting skills, I also did up a French Garden Jug to place on the island in the kitchen. Hand painted French Garden Jug. I fell in love with a brown painted French Jug on Ebay, but it was priced very high so I thought I'd try my hand at painting my own. I found an inexpensive plain metal jug at Hobby Lobby and with my already existing supply of metal craft paint, that was that. I can't wait for my lilacs to come into bloom, they'll be so lovely in this jug! Little details make for a warm and cozy and kitchen. 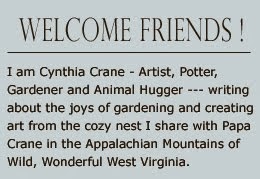 Time to step out of my comfort zone (painting and pottery) ........... and create some homespun goodness! 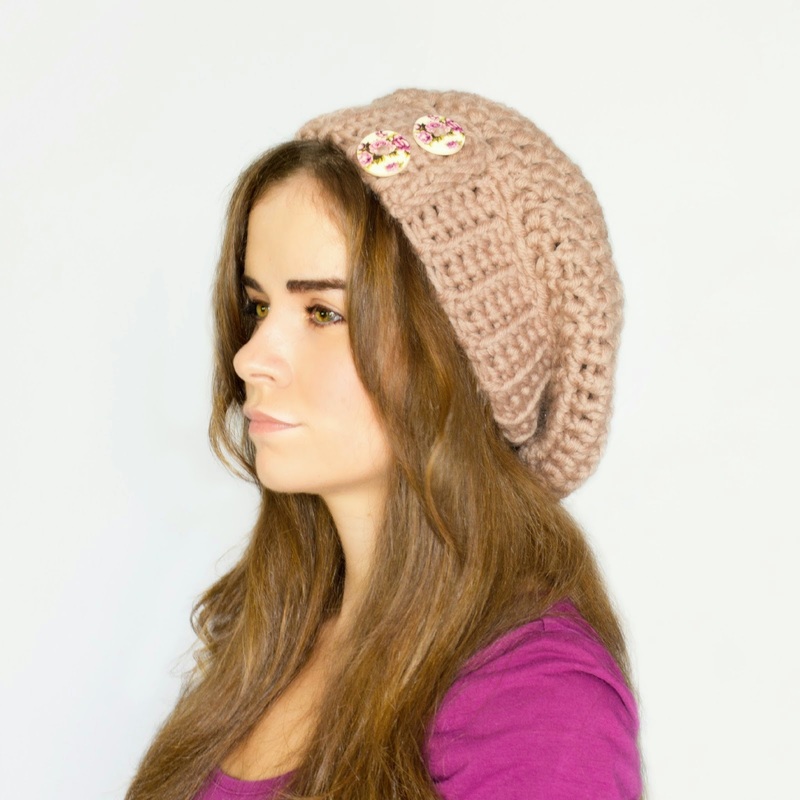 Instructions for this hat are free on her blog! Thank you Hopeful Honey! 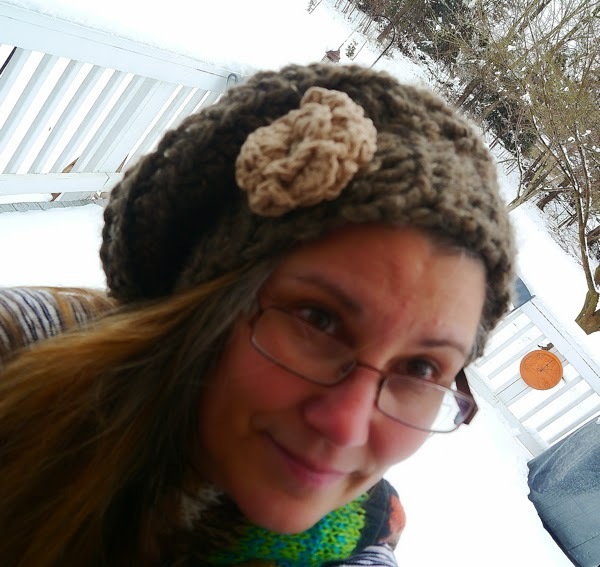 So I got some bulky yarn, dug out my old circa 1984 crochet hooks and made a slouch hat - 2 of them actually - one for me and one for my daughter. If I was being honest I'd tell you that the first one I made ended up way too large. I kept thinking, "Hmmmmm, this looks like that floppy hat Jared used to wear in his Grateful Dead days when he had dreadlocks." Jared is our son and in his teens he had the most beautiful long sandy blond hair, stick straight and oh so lovely. But what he did to his hair - ugh! Never mind, I don't want to go there! 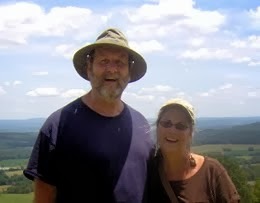 Of course, garden lover that I am, my hat had to have a flower! But determined to get it right, after a good night's sleep (Papa Crane banished to the sofa so I had the whole bed to meself), I got up the next morning and re-read the directions. I had made too many rows of double crochet! Duh! No wonder, silly! More homespun goodness and stitching 'til my fingers hurt! For the longest time I've been wanting to try my hand at making fabric cuff bracelets. So after a little shout out to my lovely friend Jill from Etsy shop Fiberluscious I had everything my little heart desired to make that happen. Darling Jill gifted me with this wonderful box of bits and bobs to help me on my way to homespun goodness heaven! 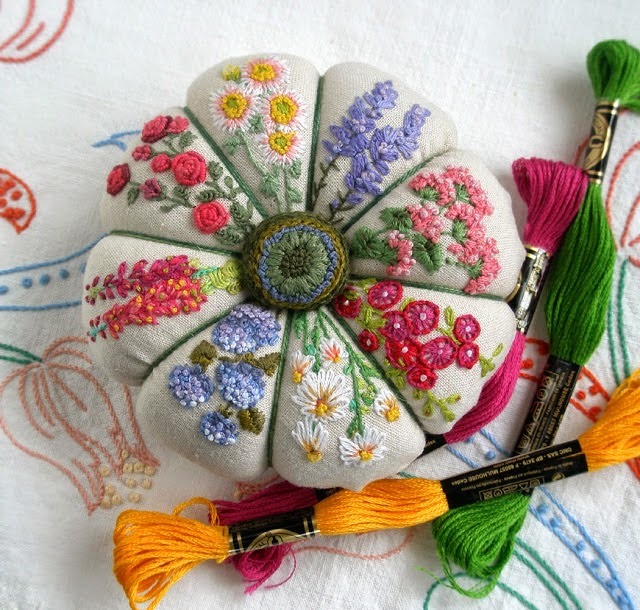 Jill makes the sweetest handmade pincushions and various other charming homespun creations, and her lovely blog is chock full of photos of these as well as quite a few fantastic tutorials! Click for Pincushion Tutorial by Jill of Fiberluscious! There will be future posts on the various things I'll be making with Jill's lovely gifts, including her charming needle felt flowers and leaves, but today I want to show the 2 cuff bracelets I made using some of her fabric scraps, ribbon and lace along with a few of my handmade porcelain buttons. New cuff bracelets from Cynthia Crane's Pottery! It has been a very long time since I've done any hand stitching at all and I enjoyed making these oh! so much! The lovely blue pincushion in the upper left of this photo is one of Jill's creations! New completely handstitched fabric cuff bracelets embellished with my porcelain buttons. I REALLY want to keep these fabric cuff bracelets, but they're headed to my Etsy shop tomorrow. So that's only a few of the fun homespun goodies I completed this winter! I'll be sharing much more as time goes on. But for now I've returned to my comfort zone - my pottery studio - in order to bring forth a few new designs that have been whirling in my mind with the onset of spring. New spring designs for my Etsy shop! Listing March 21 around 1pm ET. 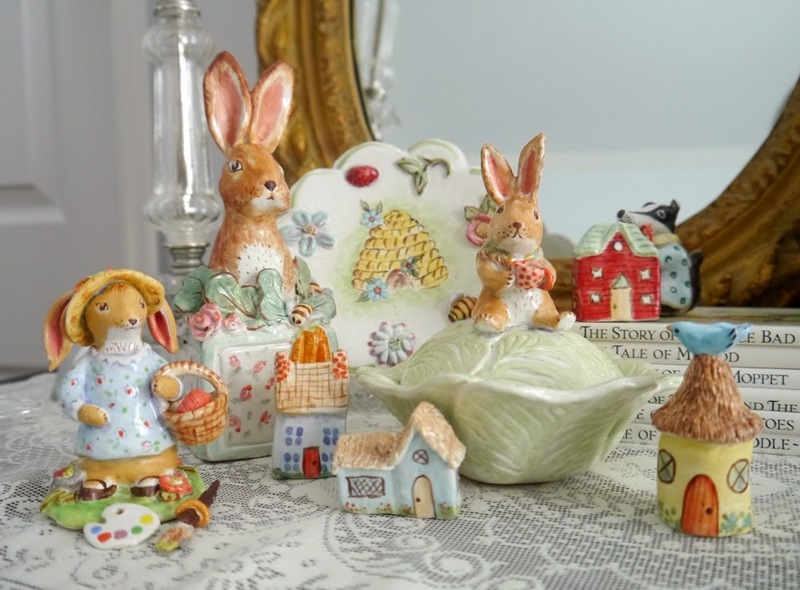 Of course bunnies are the order of the day, so too scenes of flowers in bloom with bees buzzing all around. These new designs will be listed tomorrow mid-day Eastern Time in my Etsy shop. New monthly plaques, made to hang or display on a plate stand. 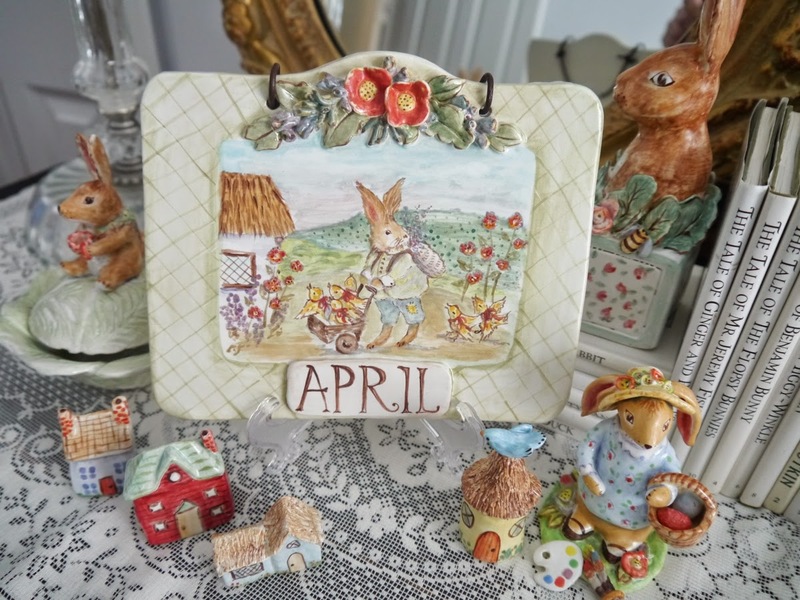 What better time than the coming of spring to introduce my new line of monthly wall plaques. I've only made this one, but special orders are welcome. There will be a new design created for each month of the year. I hope you enjoyed this little window into how I spent my winter vacation! There will be much more to come as this was only just a tiny bit of what I actually accomplished. I'd say you did good taking a break. You kept creating, were inspired to make new things, and then have come back in fine form doing what you really love, your sweet pottery creations. I love them all. Your beautiful fabric bracelets, though, really caught my eye. They're so ladylike and springy! My you have had a wonderful break creating all that gorgeousness! I am pea green over your beautiful kitchen...'tis gorgeous! I love your tray and your gorgeous jug will look delightful filled with some sweet smelling lilacs! Those bracelets smack of loveliness...they are very pretty. Your Easter 'pretties' are very sweet. As for dreadlocks....all one can say is they are best covered with a lovely knitted slouch hat!! So many pretty things you have made. Love the cuff bracelet and the bunny plaque is so cute. Oh my--- where to start?? 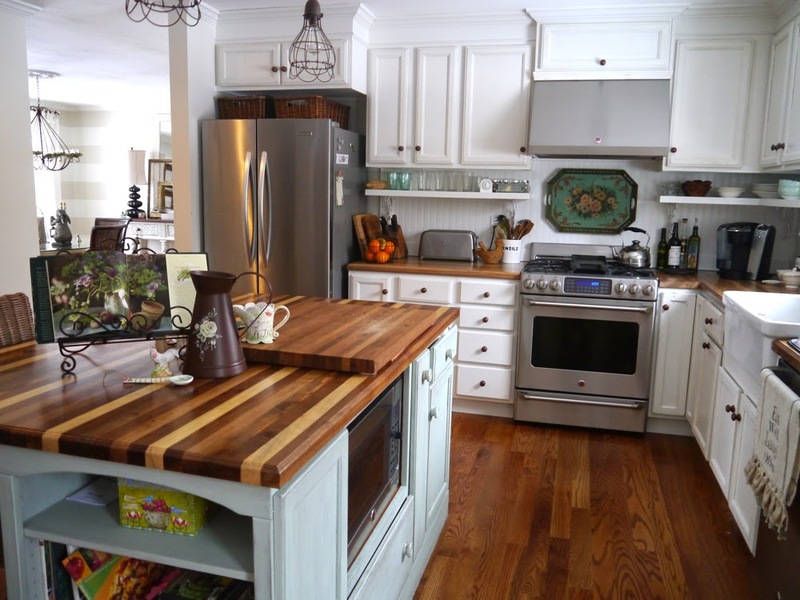 Your kitchen is so beautiful-- it belongs in a magazine!! I do love the painted tray behind your stove-- it's just perfect there!! 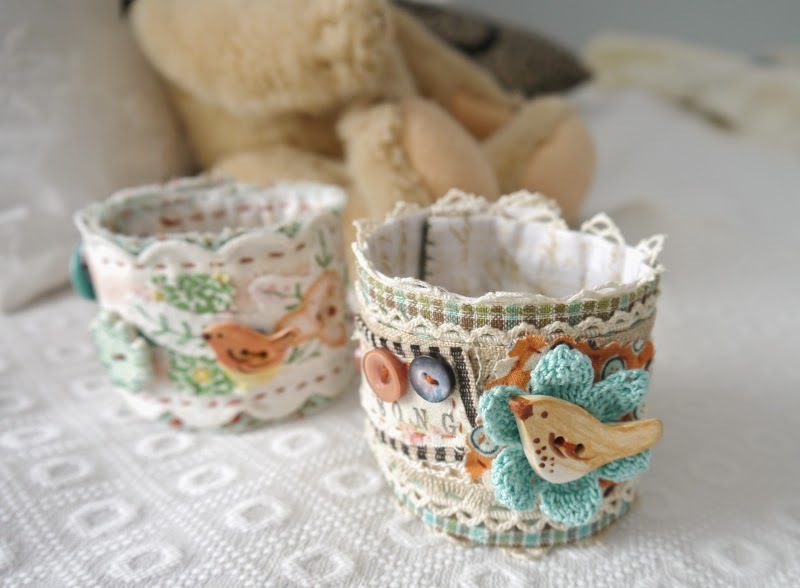 Gorgeous spring creations just born from your hands-- they will take wings and fly out of your shop as will the adorable little fabric cuffs. You did an awesome job on the hat-- it's adorable on you!! I can't crochet a lick- can't even hold the needle right!! Love the hat, it looks great on you! Those fabric cuffs and the new pottery pieces....I must go check them out! You know I love that kitchen so I can't wait to see more details of it...the tray is adorable and I love how you added more detail to that and the jug! wow! 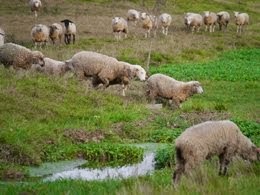 I think it's wonderful to give yourself a creative vacation. Good for you! You are so incredibly talented! everything you make is so lovely!!! Oh what sweet lovely treasures You have been creating. Everything is just wonderful. How nice to be able to cross those projects off your to do list. Forgot to mention that your fabric bracelets are gorgeous! Your handmade buttons really add a wow factor to them. Very talented, indeed. I can't believe you painted the back of that tray, I would never know, you integrated it so perfectly! It looks wonderful above the range! Cindy, you do realize you're intimidating as all get out...right? Seriously, your talents spread far and wide and the work of your hands and heart is beautiful! The plaques are fabulous...LOVE it. The cuffs are made more wonderful by the addition of the button...too cute. LOVE your kitchen...have I said "love" to the point of envy? I hope not. LOVE your kitchen and I think I've got one similar, that green tray...somewhere. Fabulous job on the jug...what a great idea. 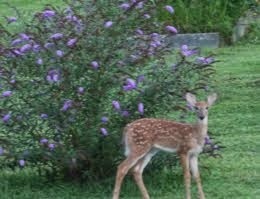 My lilacs are in bloom and smell wonderful. I raise my cuppa to homespun goodness!